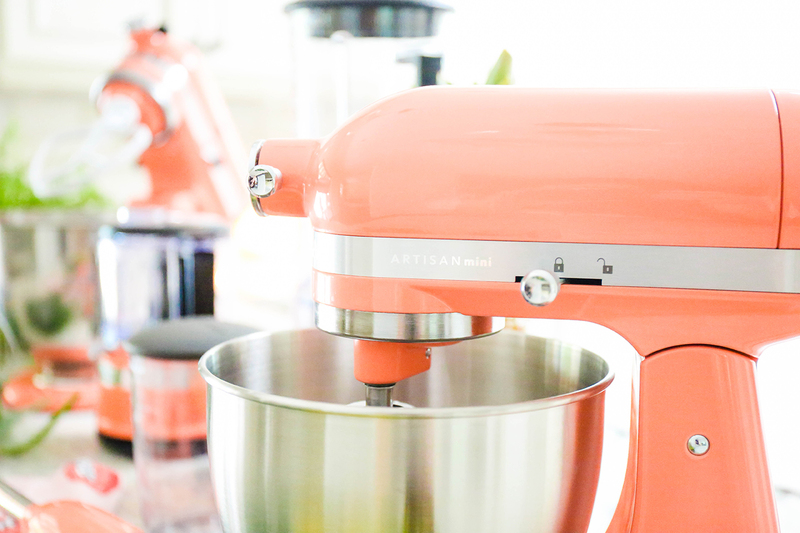 This post is in partnership with KitchenAid. If there’s one meal I could eat every day for the rest of my life, it MIGHT just be this one. We make grilled pizza margherita at least once or twice a month and I think we could make it more frequently. My family loves the salami. We love the mozz. And we totally dig the bread. The bread! I’ve been teaching Vita the importance of carbohydrates from an early age! 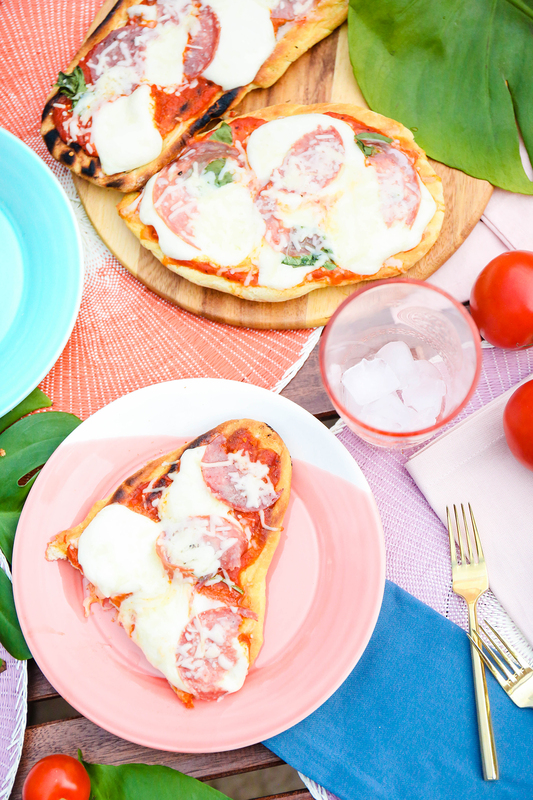 If you have the option to make homemade pizza dough, you should always do it. 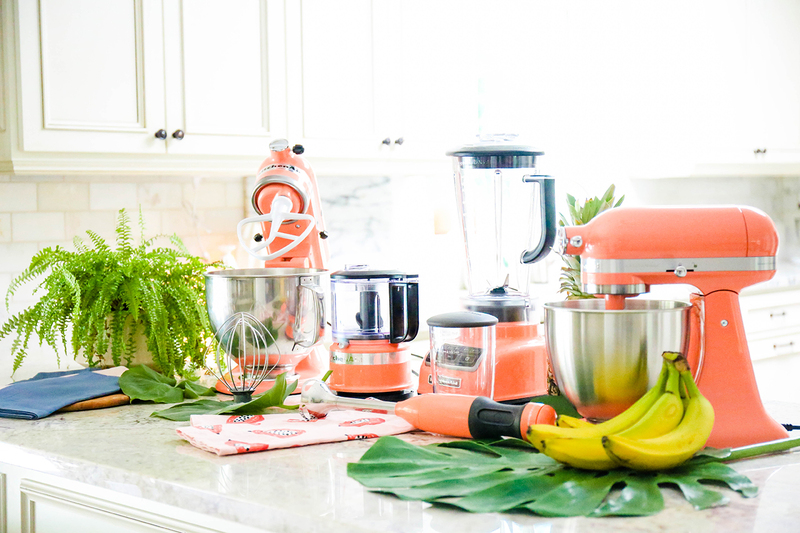 This recipe is one of my absolute favorites to share and it was so fun to partner with KitchenAid to recreate it to celebrate the launch of the brand’s new Color of The Year – Bird of Paradise collection! So, get ready to pick yo’ jaw up off the flo’. 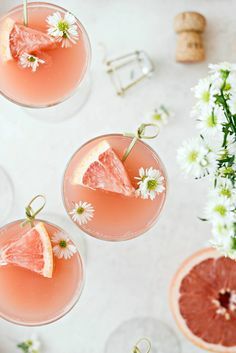 It’s like a flock of flamingos came and helped me prep my kitchen for the summer! 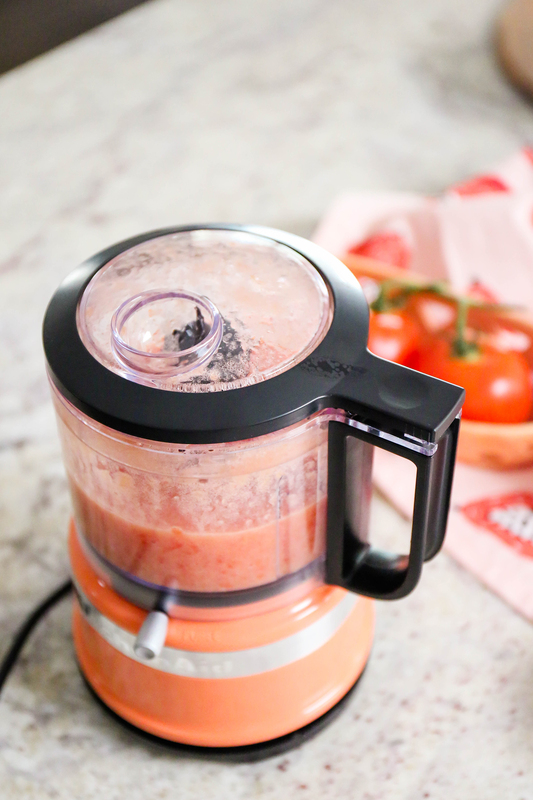 The mixer might be my absolute fave (the blender is a close second!) and is a total show-stopper in the corner of my kitchen! Now, before we go any further, I have to gush about the stand mixer that KitchenAid creates. I have had a white one in my possession for ten years. I bought it used. And it is still working to this day. TO THIS DAY! I don’t even remember how old it was before I actually bought it! It’s been a staple in my kitchen for a long, long time. So when KitchenAid asked if I wanted to share the news about the Color of The Year launch, of course I was all up ons! Would ya look at that color? It’s so botanical and beautiful and I am super excited to share some big exciting news at the end of this post! 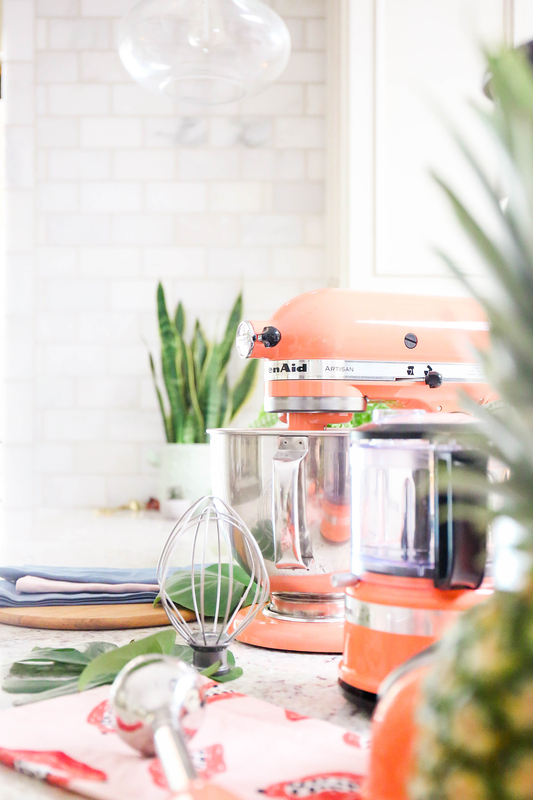 You can view the entire Bird of Paradise collection over here and check out the the Artisan® Series Tilt-Head Stand Mixer (comes in both a 5 Qt and 3.5 QT), the Diamond Blender® , 3.5 Cup Mini Food Chopper, 2-Speed Hand Blender, and 5-Speed Ultra Power Hand Mixer! To check it out, I thought I’d put the mixer through a test run and see how it held up to mixing and kneading my homemade pizza dough. And it was as perfect as ever. I’m not even kidding when I say that Logan said it was the best batch we’ve made yet. 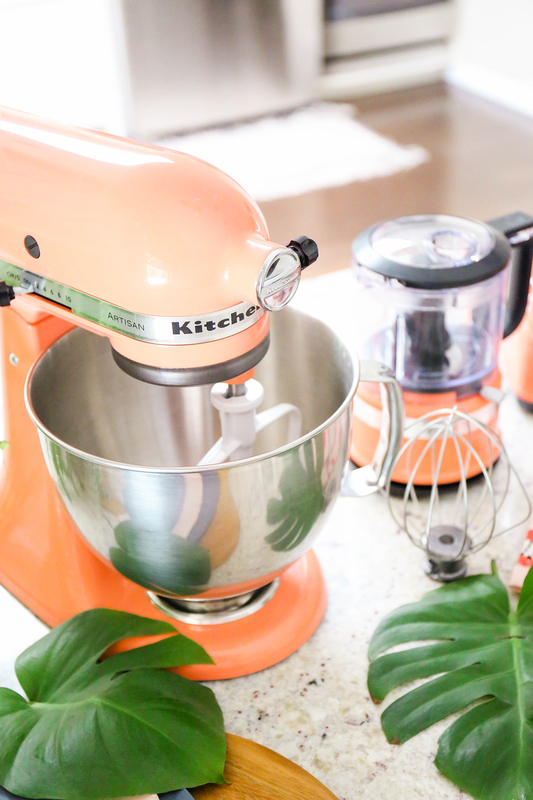 The color that KitchenAid chose is so spot on. While white in the kitchen will always be a classic, folks are getting braver and incorporating punchier colors into the mix. We love our kitchen, but there are still so many things I want to do to lessen the traditional vibe and bring in the more modern and colorful vibe I love. So we’ll start by switching out the mixer! Anywho, we mixed up some dough and used the mini chopper to make some homemade tomato sauce. Which. You guys. A lot of times we just use a jar of store-bought, but I can’t go back. Only handmade sauces and homemade breads from here on out. And I’d like people to bring me Diet Coke while I wear fuzzy slippers and rest on the couch. I’m just so in love with that color. It’s honestly a tropical explosion in the kitchen anytime we bake or make with the mixer. All of the bowls, and then, of course, further accessorizing with the apron and hand towels! 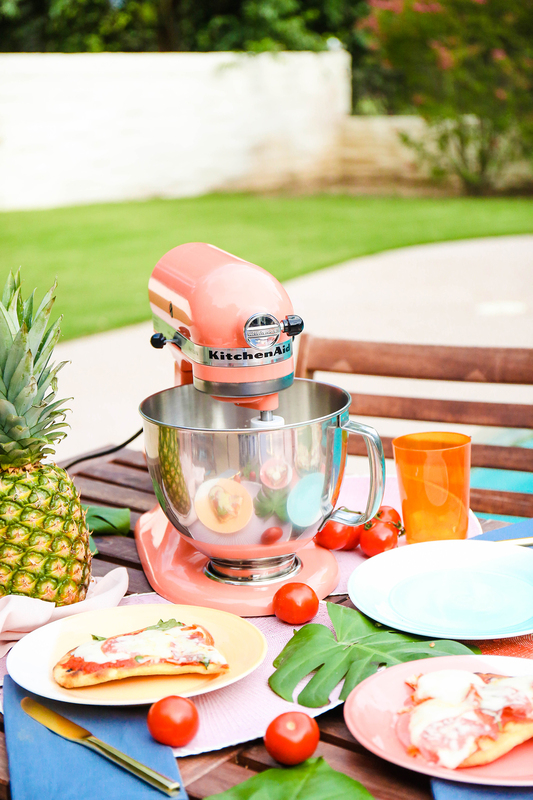 KitchenAid truly tapped into current design trends and thought about those who feel like they’re on a mini getaway anytime they cook! One of the key steps to a delish pizza is the quality of ingredients used. We’re talking fresh, people. The tomato sauce is made while the dough is rising. The basil and tomatoes are fresh from the garden. The cheese was just milked from a cow. (I kid on that last one.) Let’s mix! Combine all of the dry ingredients into the bowl and slowly add the water and olive oil. 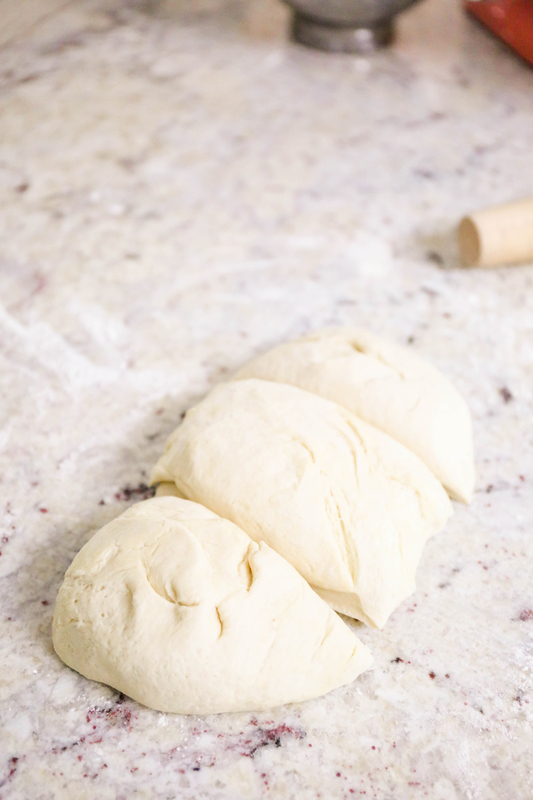 Let it knead for ten minutes to form a smooth ball of dough. Cover and let the dough rest and rise for an hour until it has doubled in size. After it has, punch it down and turn it out onto a lightly floured surface. 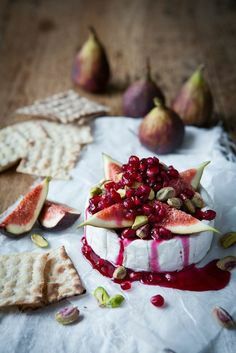 Cut it into three separate sections and roll each out into a rectangle shape. Roll those puppies out and then set aside. Time to make-a the sauce! That sounded Italian, right? Grab that cute little mini chopper and throw some tomatoes in. Puree them and then add a little garlic and salt. In a saucepan, bring the tomatoes to a boil, and then reduce heat to medium-low and let simmer for thirty minutes. By now, the kitchen smells amazing. You’re welcome. 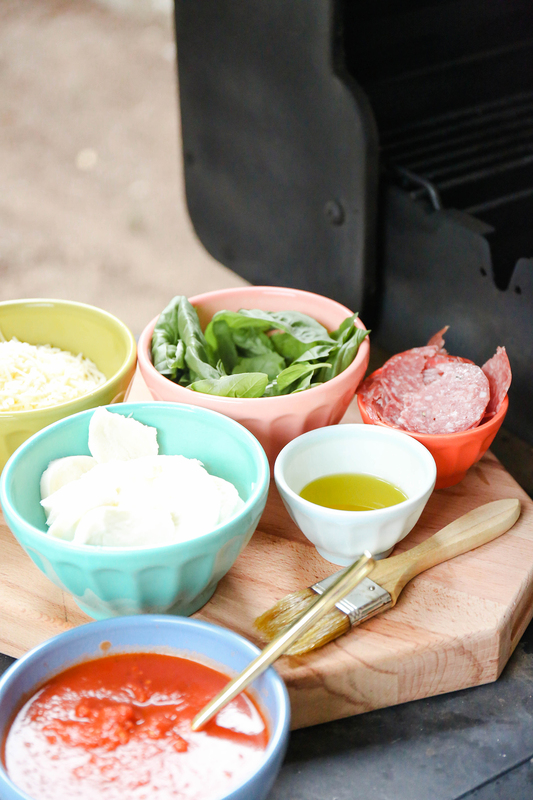 Round up your ingredients and heat up the grill! 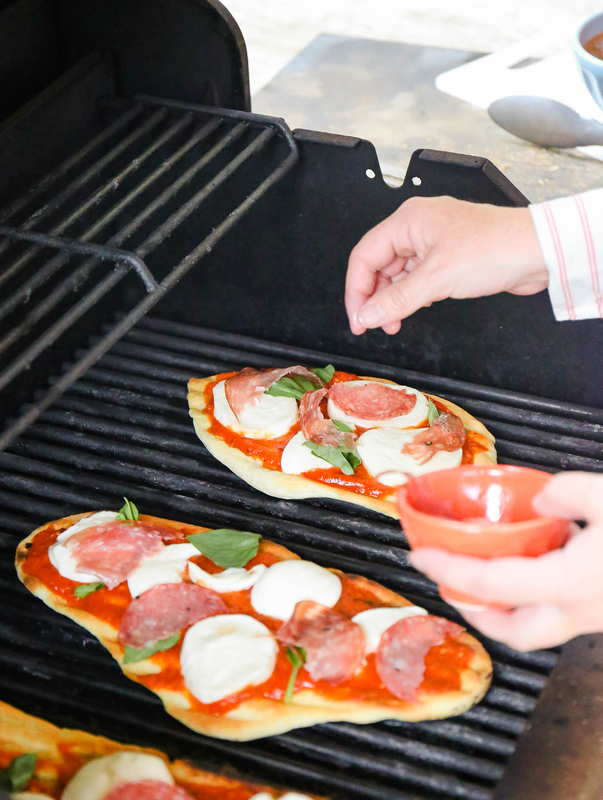 Brush one side of each pizza with olive oil, and then put the oil-side down on the grill. Immediately brush the tops of each pizza with more olive oil. Allow to cook for about 4-5 minutes with the lid closed. Once that side is done, gently flip each pizza over and start adding your toppings. Start by adding your sauce, then the mozzarella, basil, and genoa salami. Finish everything off by sprinkling a little of the cheese blend on top and close the lid! Reduce the grill heat to low. You just want the heat of the grill to melt the cheese and finish the pizza. Remove those beauties from the grill and serve them up while still hot! It was easy to style this table around the colorful theme! I’m not saying that a stand mixer is an absolute-hands-down-you-need-it-or-your-life-is-over staple in the kitchen, but it DOES make life one million times easier when making. For me personally, it’s something I have to have. Growing up, there was always one in the kitchen and I don’t think I could do without it! I love being able to throw anything in the bowl and walk away. 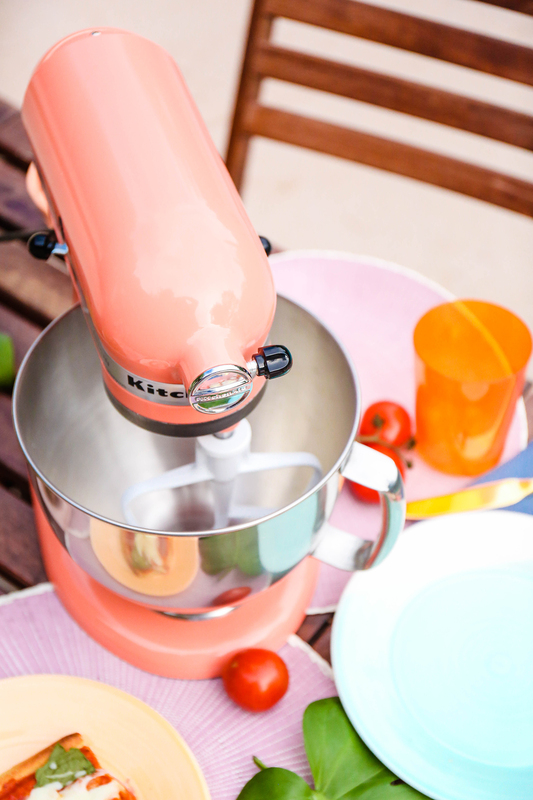 If you have always wanted a KitchenAid stand mixer, but just haven’t had the chance to splurge on one, don’t fear! I’m so excited to tell you that WE’RE GIVING ONE AWAY! That’s right. 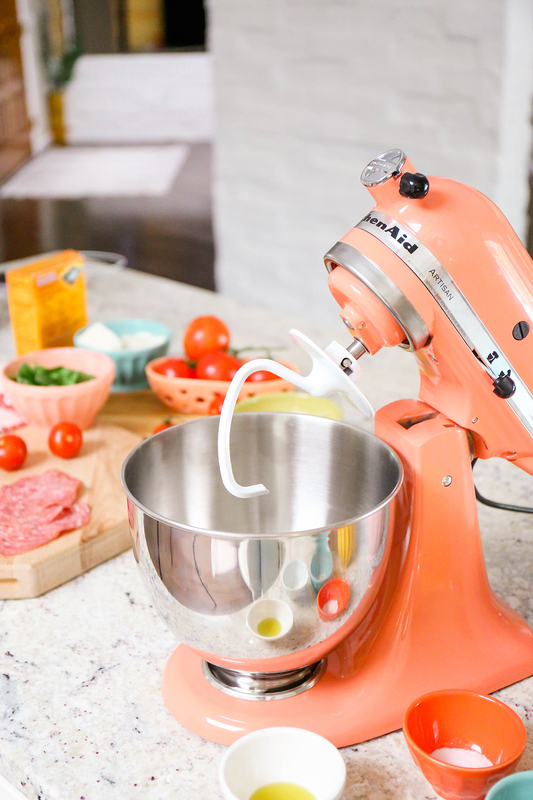 You can have your very own Artisan® Mini 3.5 Quart Tilt-Head Stand Mixer in that beautiful coral color that breaks hearts! All you have to do is head over to this photo on Instagram and follow the instructions! It’s easy peasy Bird of Paradise breezy! Good luck! 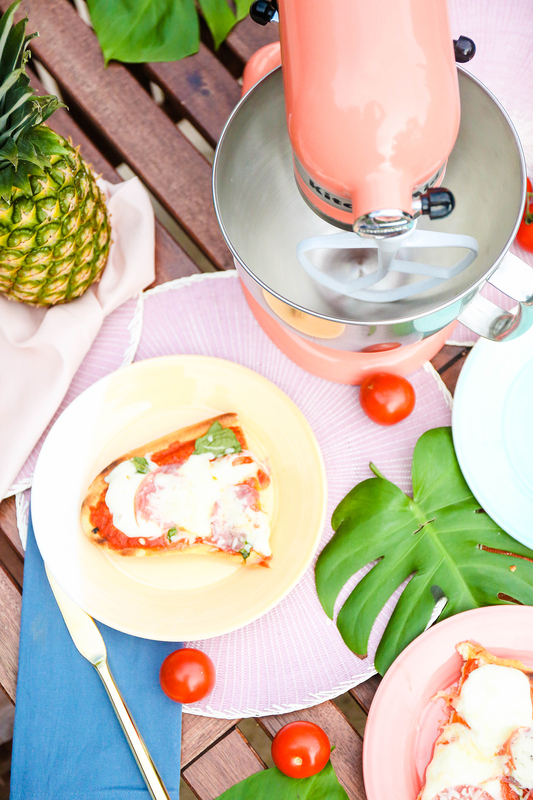 We thought we’d even try our hand at making a little video all about the new Color of The Year Collection and how we rocked it with this pizza! It’s short and sweet so check it out and tell me what you think! 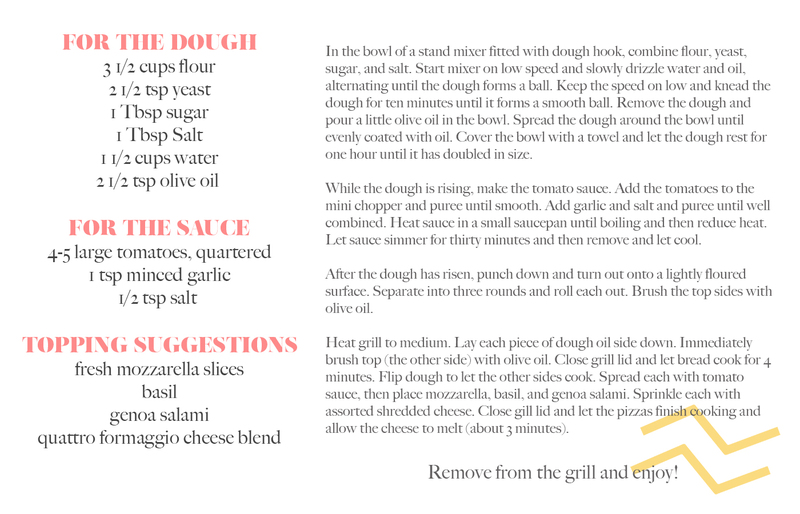 To make your own Grilled Pizza Margherita, follow the recipe below! n the bowl of a stand mixer fitted with dough hook, combine flour, yeast, sugar, and salt. Start mixer on low speed and slowly drizzle water and oil, alternating until the dough forms a ball. 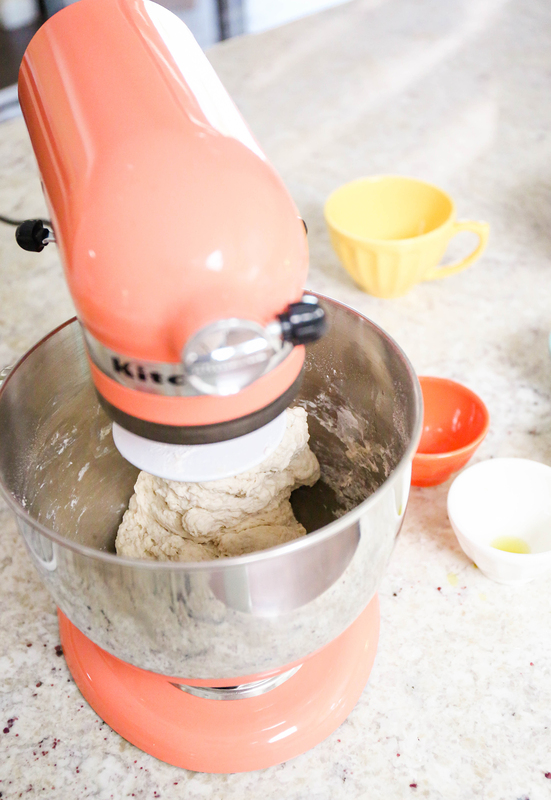 Keep the speed on low and knead the dough for ten minutes until it forms a smooth ball. Remove the dough and pour a little olive oil in the bowl. Spread the dough around the bowl until evenly coated with oil. Cover the bowl with a towel and let the dough rest for one hour until it has doubled in size. While the dough is rising, make the tomato sauce. 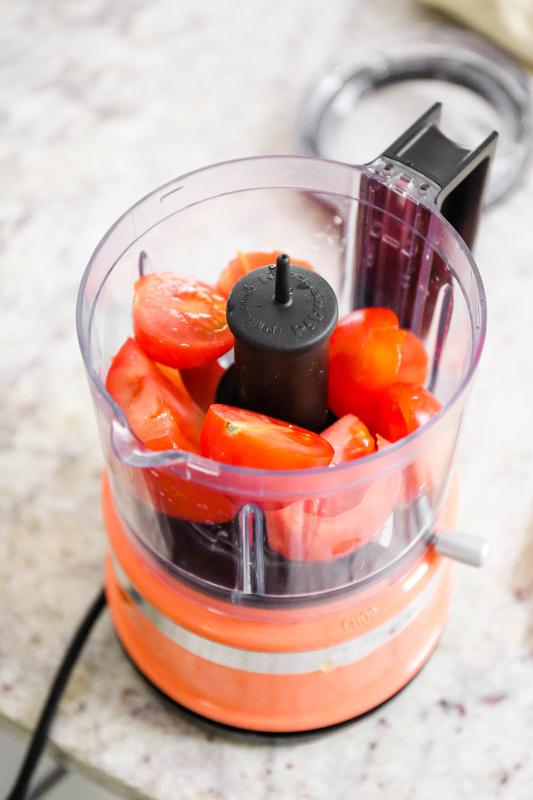 Add the tomatoes to the 3.5 Cup Mini Food Chopper and puree until smooth. Add garlic and salt and puree until well combined. Heat sauce in a small saucepan until boiling and then reduce heat. Let sauce simmer for thirty minutes and then remove and let cool. After the dough has risen, punch down and turn out onto a lightly floured surface. Separate into three rounds and roll each out. Brush the top sides with olive oil. Heat grill to medium. Lay each piece of dough oil side down. Immediately brush top (the other side) with olive oil. Close grill lid and let bread cook for 4 minutes. Flip dough to let the other sides cook. 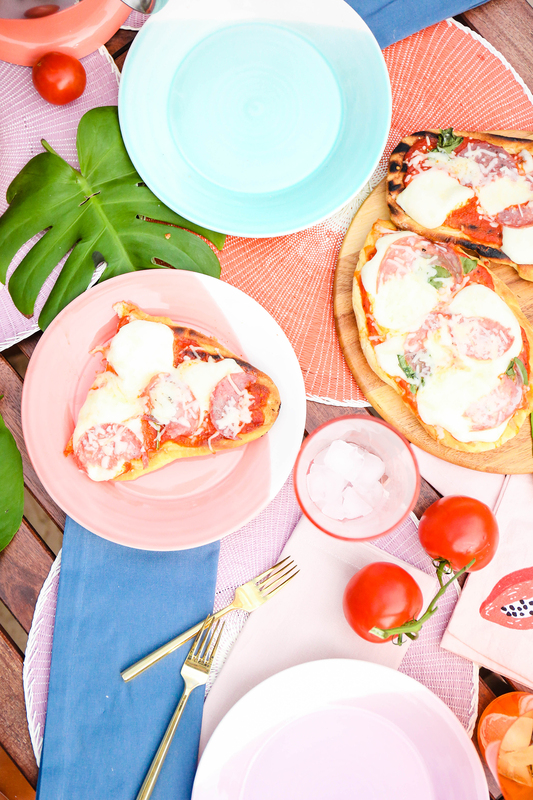 Spread each with tomato sauce, then place mozzarella, basil, and genoa salami. 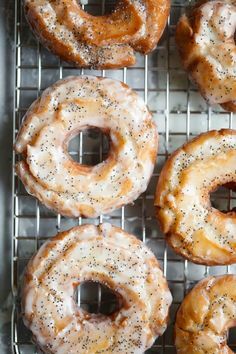 Sprinkle each with assorted shredded cheese. Close grill lid and let the pizzas finish cooking and allow the cheese to melt (about 3 minutes). Remove from the grill and enjoy! 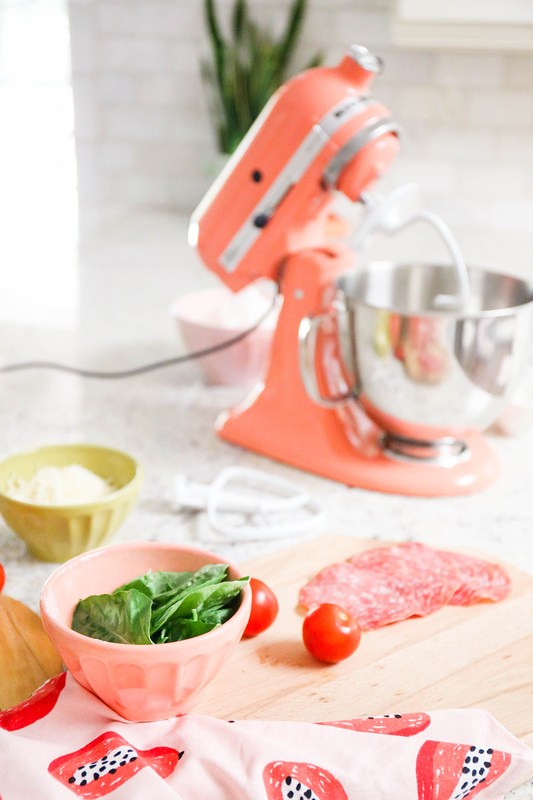 **This post is in partnership with KitchenAid, a brand that believes in making life pretty in the kitchen, to celebrate the launch of their new Color of The Year collection. All opinions are my own! Thank you for supporting the brands that help PROPER keep creating! Thanks, Angie! The color is my FAVE! That color. I’m seriously obsessed! It’s gorgeous. I love my kitchenaid mixer! They are the best. And that pizza! It looks amazing! This pizza is no joke! I’m serious. We love how the dough grills up! Easy on a week night! Oh my gosh, thank you, Taralie! You are so sweet! This was a fun one to put together and it’s easy with such a pretty color! I love that color. That would brighten up any kitchen! I Think I need some new small appliances! I also can’t wait to make some of those pizzas. They look amazing. Love kitchen aid, so excited to see the new color. Is it available now? This color is gorgeous and totally in style. I love it! I need this in my life! ❤️ Love the video, too! Oh, thanks, Heather! I was honestly super nervous about the video, but it was really so fun to do! Mmmmmmm!!!!!!!!! You are a true Italian! !